I’ve recently discovered the mail. I don’t know where the stuff comes from or who puts it in the big mail box, but every now and then, I get a fun surprise. I never know what Dad’s going to pull out of that shiny thing. It’s almost as exciting as Christmas! On the other hand, Dad doesn’t seem to like the mail as much as I do. When he gets the mail, I usually hear him mumbling something about bills. I don’t really understand the whole “bill” concept, but I’ve decided it’s not for me. Sometimes I see these colorful, shiny ads that look like fun and catch my attention. Every now and then Dad will give them to me to play with and rip into tiny little pieces. Recently, Dad helped me send letters out to some of my favorite baseball players. We went and dropped them all in our mailbox. A few weeks have gone by and Dad has started pulling out some nice surprises for me out of the shiny box. Here’s one I got yesterday from Mike Mussina. He’s a seven time gold glove winner and won 20 games last year. He recently announced his retirement. I hope Moose enjoys retirement as much as Pappy does. Anyway, I was really excited to get this back. Mike had a great career and it was really nice of him to sign my cards. Thanks Mr. Moose! I appreciate it. Late last season, I sent some mail out to a few of my favorite players. I had to get Dad to help since I can’t reach the mailbox. I was hoping to add a few autographs to my collection. I got some responses and I want to start posting them on my blog. To start it off, here’s a card I got back from Jeremy Affeldt. He even personalized it for me. And in case you haven’t already heard, the Rockies got a new pitcher today. Jason Marquis is coming to Colorado this season. 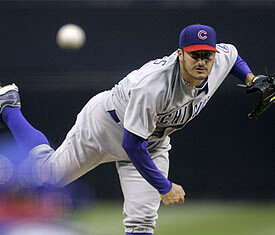 He played for the Cubs last year and I think he’ll make a great addititon to our starting rotation. That’s it for now. I’m ready for bed.